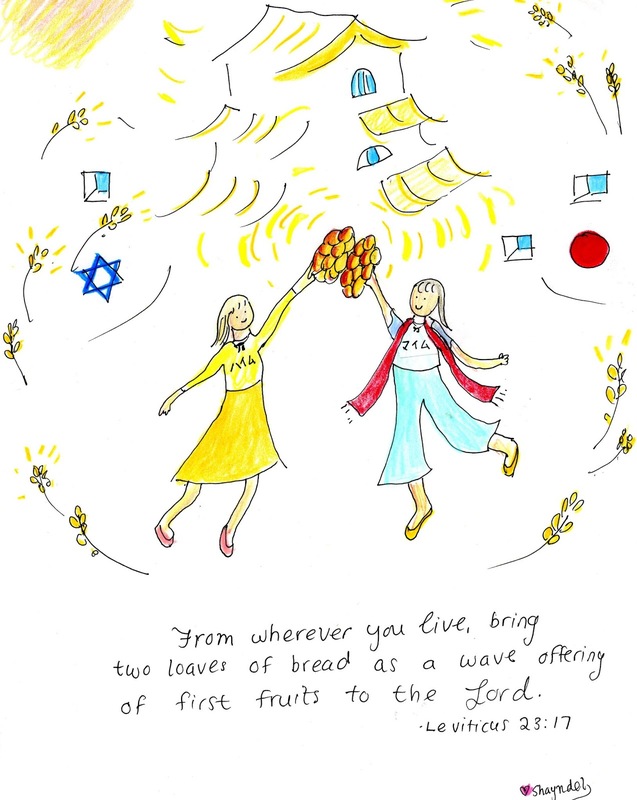 From wherever you live, bring two loaves of bread as a wave offering of first fruits to the LORD. I love the spring feasts center around bread!! PS my Shavuot postings are late! But as its still the month of Sivan...still within the Hebrew month, I am seeing if I can smoothly insert them in! For more postcards from Shavuot, please enjoy posts here. Beautiful post. I love your challah bread and the cranberry smoothie. Oh, I love your two loaves of bread. your handwriting - and, of course, your drawing. It's never too late for good things: to celebrate, to pray to God, to offer love, kindnes, bread and smoothies. You keep me smiling. I always enjoy your posts! Here we have also Israeli oranges (Jaffa's). I made challah for shabbos for years but after back surgery it became too much. I love your little drawings. They are so cute!